David is a self taught New Mexico based mixed media artist and painter. Born in Brooklyn, NY, & raised in Albuquerque, NM. His love for collecting Judaic and abstract art, along with his appreciation of the New Mexican scenic views and folk art, influenced him to forge it all together; creating his own work, representing his outlook onto the world of art, with mixed media, abstract southwestern and city landscapes. Through later encouragement from good friends in the art industry and enthusiasts, David is now sharing and showing his work. His paintings are known for being "whimsical, having a rich balance of brilliant luminescence, with an essence of natural elements and textures, set with an occasional touch of non-objective realism and symbolism, resulting with the viewer's ultimate interpretation left unto themselves." 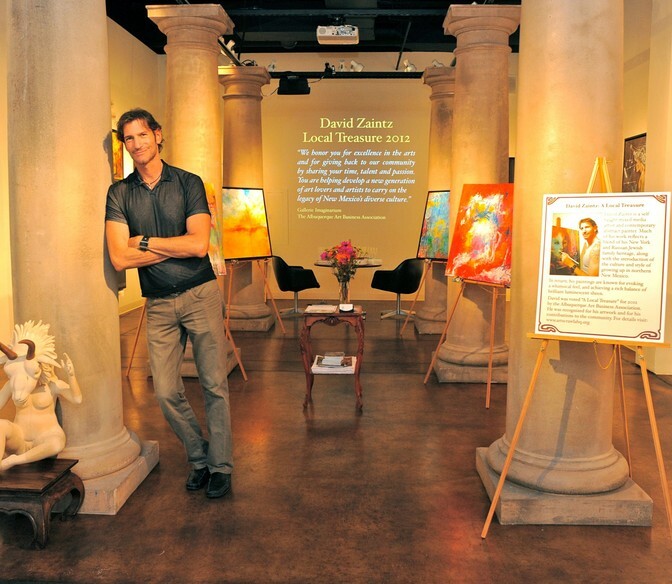 David was named a Local Treasure in 2012 by the Albuquerque Arts Business Association, as well as being voted in as the first recipient of OUTstanding Artist, through the ABQ Pride Committee in 2015, & again in 2016. He is currently showing and selling his work at The Sumner & Dene Gallery, in the heart of downtown Albuquerque, and Reside Home, an interior Design showroom located in the rail yard district in Santa Fe, New Mexico.